Jesus said, “Whoever has ears to hear, let them hear.” (Mark 4:9). Clearly those who cannot hear do not get it, and those who can hear, should. What did you hear when this well known parable of Jesus was read just now? I suggest the majority of us think we are like the good soil. We are sorry for others whose hearts are like the rocky, weedy or hard soil. Lets be honest: Is that what you thought? That is because when the Scriptures are read, we invariably see ourselves in the best possible light, we tick the box and move on to the next passage. This is a very serious mistake. When Jesus said, “Whoever has ears to hear, let them hear.” (Mark 4:9) he was giving a warning. That is the main point of the parable. Lets begin by noting the context. What do you read into the parables which Mark describes? He is already attracting large crowds and stirring controversy. Jesus therefore chose to speak in parables. Why? Because story is a more effective and a more memorable means of communicating truth than straight propositions. We remember stories easily but not speeches. We can retell them especially if they are short and funny and relevant. That is the power of story. There’s a second more important reason. Communicating by story is a wise approach in a hostile environment. Story is a form of code. Jesus had indeed been born to die, but not yet. He would only reveal why he came when the people understood who he was. You know what they say, “Familiarity breeds contempt” That was certainly true even of Jesus own family. In the verses preceding this story, his family had come to take him home fearing he had lost his mind. He simply rebukes them. Jesus has just rebuked his own family and now he criticizes his disciples and warns the crowds. That’s the context. If familiarity does not always breed contempt, it can certainly breed complacency. We live in a culture of niceness where causing offence is not just bad etiquette. Causing offence is increasingly a criminal offence too. Which is why reading Mark Galli’s “Jesus, Mean & Wild” is so refreshing, if unsettling. We are discovering that following Jesus was an uncomfortable, unsettling, hazardous experience. We tend to gloss over verses such as this because we can’t imagine Jesus doing anything other than present the gospel as clearly and plainly as possible. Surely he must want everyone to respond. He seems to be saying the secret is only shared with a select few. Which is precisely what he does. But then what did Jesus say to his closest followers? “Don’t YOU understand this parable? How then will you understand any parable?” (Mark 4:13). The disciples, at least at this point, cannot be good soil, because they clearly do not yet understand. So lets start again and listen carefully to Jesus. Jesus has just told them that the secret has been given to them. So although the disciples do not get the parable at this point, they will, if they continue to listen and learn from Jesus. If that was true for them, it is also true for us. To whom then is the secret of the kingdom given? Most of the parable is a warning. A warning to the proud, to the complacent, the worldly – those who think they are OK when they are not OK, or they wont be in the near future. We tend to focus on the four types of soil and begin to put our relatives and friends in one of them. That’s not the point. Remember the key verse? “Whoever has ears to hear, let them hear.” (Mark 4:9). 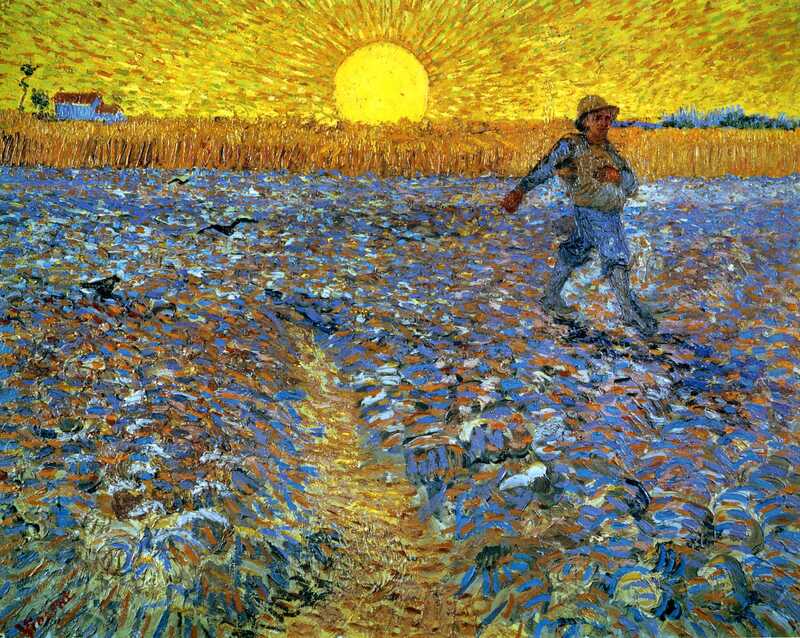 So listen carefully… Jesus tells us the sower is God. The seed is the word of God – the gospel. The seed is cast everywhere. What happens to it depends on the soil. You can tell when someone is not listening to you. Their eyes glaze over, as if they are looking right through you. They are miles away or they blank you out. Jesus said “hearing they hear not”. What makes people hard? Things like cynicism and pride act like concrete and the good news just bounces off. These are impressionable people who hear the word and make an emotional decision. They join all the groups, buy all the books, go on all the courses. But when they begin to experience the cynicism of relatives or the sarcasm of neighbours, or persecution from the authorities, their fervor dries up, their zeal is transferred to other pursuits. The problem is the lack of depth to enable their roots to grow down deep and draw up nourishment. How can we avoid shallowness? So, the Hard Path stands for those who can’t or won’t listen to Jesus. The Stony Path, represents those with a shallow faith that easily dries up in adversity. These are people who hear the word gladly. They are sincere, and they make a solid beginning in the life of faith. God begins to bless them. They have children, grandchildren. They succeed in their jobs, promotion brings a pay rise but also additional responsibilities. They must be away more often. There’s the second home to keep up, the club membership privileges to enjoy. And before long, these good things begin to choke out their first love for Jesus. What may be choking your faith? There’s another reason weeds grow. Laziness. Every gardener knows that a weed free garden doesn’t happen by accident. It takes a lot of hard work to remove the weeds that would choke the vegetables and flowers. We must be ruthless with weeds. The Hard Path describes an indifferent faith that’s easily deceived. The Stony Path, a shallow faith that quickly dries up. The Thorny Path, a cluttered faith that becomes choked. What a difference when seed is sown on good soil! What a difference hearing, understanding and obeying God’s word makes. The Bible is the word of God. It is the seed Jesus is talking about here. When we share the word of God, people will trust in Jesus. Not may but will. It’s inevitable. A certainty. The Context of the Parable. The Meaning of the Parable. My own hearing loss brings this parable into sharp focus for me. I have to be intentional in wanting to hear you. I have to concentrate to listen. And I have to especially concentrate to listen to God. Because prayer is as much about listening as it is speaking. Each one of us is somewhere in God’s field. The point of the parable? Its not about classifying ourselves and other people in one of four categories of soil, least of all being complacent in thinking we are the good soil. Its about heeding the warning and being ruthless with anything that stops us being the good soil. The seed is the word of God. Get to know it and love it. Do not be ashamed to read it, to quote it, and to share it. Learn to handle is accurately and sow it widely. Look for opportunities to share Jesus with your friends and family, neighbours and colleagues. Remember that our world is God’s harvest field. Have confidence in the seed. Always be sowing the seed. Pray to the Lord of the Harvest to bear fruit in you and through you, by his grace and for his glory. Lets pray. Thank you to Peter Loughman for the opening illustration and introductory ideas, and of course, Mark Galli and his book, Jesus, Mean and Wild. This entry was posted in Anglicanism, Bible, Evangelism, Sermons, Theology on November 15, 2015 by Stephen Sizer.